If you want to experience the old Asia first hand, this charming laid back colonial capital city has a lot to offer the visitor. Vientiane has had a turbulent past and the Vietnamese, Khmer, Burmese, Siamese and the French all have had a hand in its history. 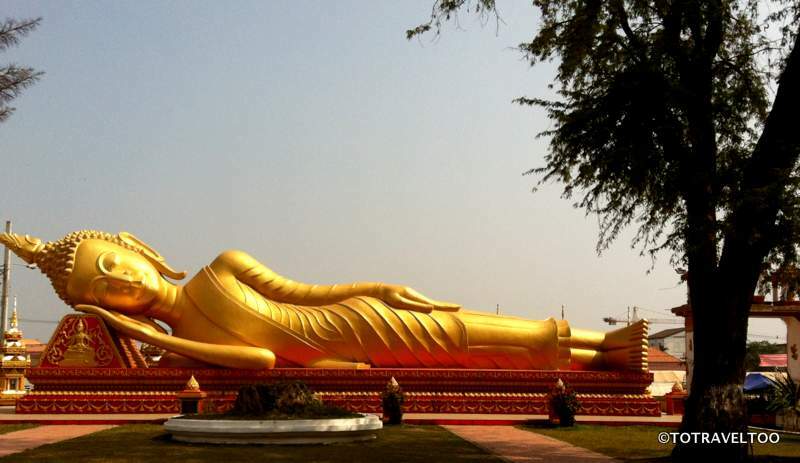 In 1560 King Setthathirath relocated the capital from Luang Prabang in the north to the present location of Vientiane. In 1893 Laos was passed to French rule and became a protectorate in 1899 and in 1953 it sought independence from France after several successful campaigns led by local independence groups. During the Vietnam War, Laos became the most heavily bombed country, many villages were destroyed and thousands were displaced. After the government of Laos introduced market reforms in 1988 Laos has grown rapidly as a nation and tourism is its fastest growing industry. It is one of the poorest countries in South East Asia but one of the friendliest that we have visited. 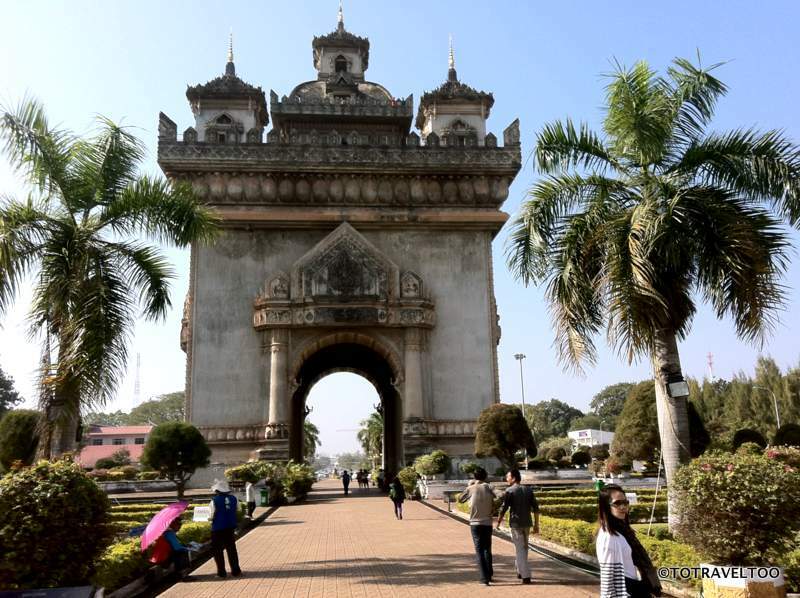 Laos’s equivalent to the Arc de Triomphe in Paris, Patuxai or the Victory Monument (as it is also known) stands proudly in the centre of Vientiane. The story goes that in 1968 it was built by cement donated by the US government that was originally designated for the construction of the new airport. The monument is dedicated to those who fought for independence from the French. For USD$0.50 you can climb to the top of the monument for 360 degree views of Vientiane. ​That Dam Stupa, also known locally as the Black Stupa, stands unloved and overgrown in the centre of a roundabout in Vientiane. The locals still regard it as the city’s guardian spirit. ​Two stories have been handed down over the years, the first that it was once inhabited by a seven headed dragon that protected the city from the threat of the Siamese and the second story states that it was once covered in gold which was stripped by the Siamese army in 1828. We visited Wat Si Saket on Lan Xang Road in Vientiane. It was built in 1818 in the Siamese architectural style and houses a museum and more than 6,800 Buddha images. The images are made from wood, stone and bronze and dates back from the 16th to 19th Century. 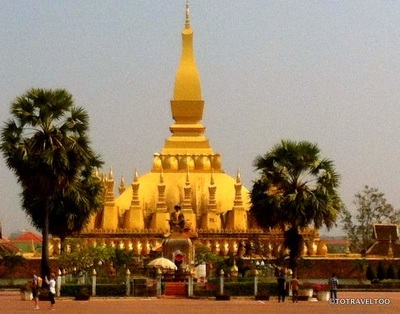 Pha That Luang is one of the most important Buddhist monuments located in the centre of Vientiane. Standing 44 metres high and covered in over 500kgs of gold leaf it is considered the national symbol of Laos. It is surrounded by 30 small stupas. Nestled on the banks of the Mekong River, with views of Thailand in the distance, Buddha Park is located 25 kilometers from Vientiane. 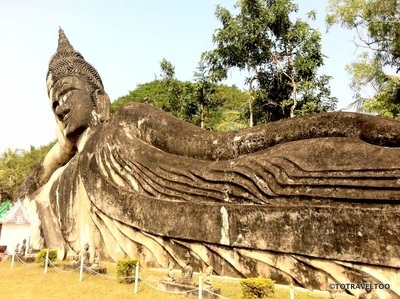 Designed and built by Luang Pu, a yogi-priest shaman in 1958, the park consists of over 200 Buddhist and Hindu sculptures constructed in concrete. It can be hot and thirsty work wandering through the park especially in the middle of the day, treat yourself to a hydrating coconut drink from the local stall within the park. If you are travelling by tuk tuk from Vientiane be prepared for a bumpy dusty 25-kilometer ride, which should cost you no more than 200,000 kip approximately USD25 return. The entrance fee to the park is 10,000 kip approximately USD1.22. ​There are many local cafes and restaurants serving the locally grown Laos coffee and French style baguettes throughout Vientiane. We are lovers of Indian food and spent many nights at the Taj Mahal Indian Restaurant two blocks away from our accommodation. When you see the same locals there night after night you know that you have chosen well. There are many vegetarian options available and the local beer ‘Beerlao’ was always cold and refreshing. Along the Riverfront of Vientiane you will find local food stalls that set up early evening serving up the freshest seafood and meat barbecued right in front of you. 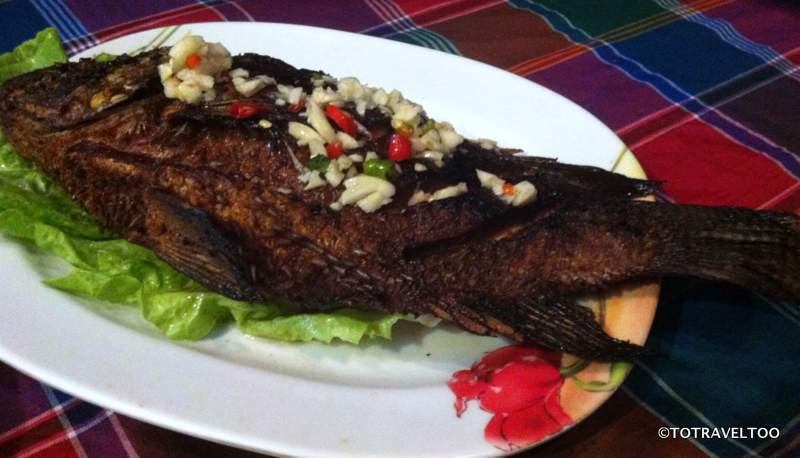 We chose deep fried fish at 56,000 kip (USD7.00). The spicy smells from the cooking teases the senses, the view at sunset is glorious and the atmosphere is electric as diners enjoy themselves. ​If you want to try your hand at cooking like a local then the most famous market in Vientiane is the night market along the Riverfront. 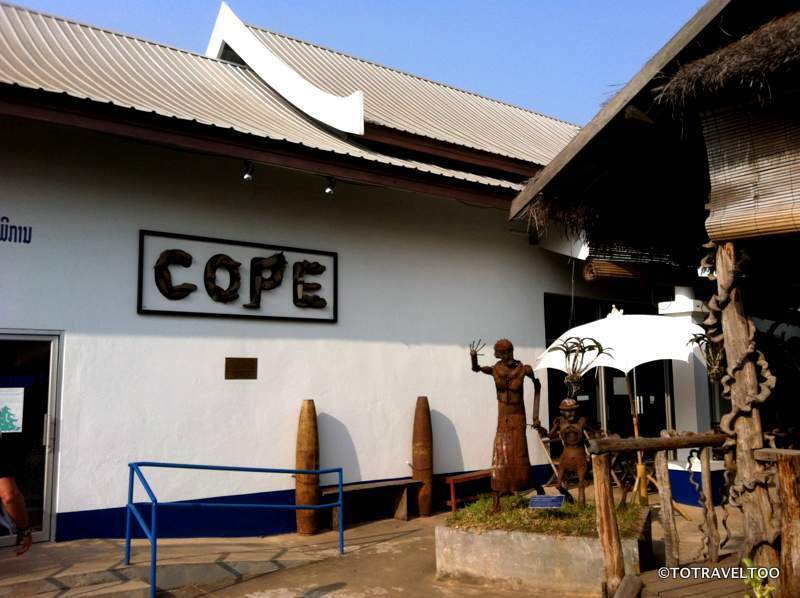 It opens at sunset and has a myriad of souvenirs, textiles and clothing. Although you may find goods cheaper in other local markets it is well worth the visit. Whilst you are there you can watch the locals exercising in the coolness of the evening. The morning market called Talat Sao is located on the corner of Lan Xang Road and Khu Vieng and is open from 7am to 4pm and has lots to offer the visitor from fruit and vegetables, to souvenirs, home electronics and an array of food stalls. During 1964 – 1972 580,000 bombing missions by the US Government dropped over 2 million tons of ordnance in Laos. Most of these bombs were cluster bombs, which break up mid air sending thousands of bombs scattering over the countryside. 30% of these around 80 million still lay in the farms of Laos waiting to be exploded. COPE which stands for Cooperative Orthotic and Prosthetic Enterprise ensures that people who have been affected have local free access to a quality nationally managed rehabilitation service which provides arms and legs and Physiotherapy and Occupational Therapy to the victims. Entrance is free. The displays and stories are moving and there is a coffee shop on site.